I love that! Really different. Congratulations! Your locket is so pretty! so pretty and sweet. congrats! 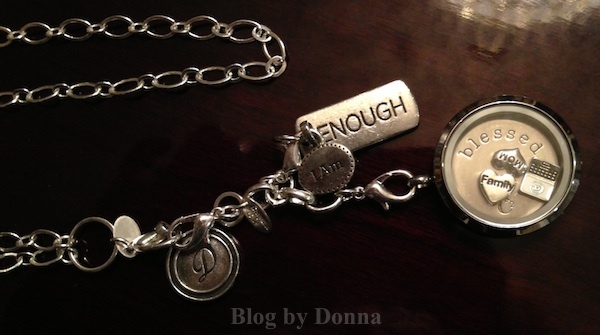 The three charms inside the locket: Mom, Family, and a laptop (representing blogger). 🙂 The 3 tags on the chain are my initial “D”, and “I am” “Enough”. Because, well… I am enough! 🙂 And the plate inside the locket says “Blessed”, of which I am over abundantly blessed. I love Origami Owl. Just be careful, they are addicting! LOL Happy Anniversary! So pretty! I’ve been wanting one of those! Yes, the locket is lovely! Wow! 11 years! Good for you! Working on my first year!